Why Do We Celebrate St. Patrick’s Day? St. Patrick’s Day is fast approaching, but before you get ready to celebrate, do you know what you’re celebrating? St. Patrick’s Day is the Roman Catholic Feast day to honor St. Patrick (Patricius in Latin), Ireland’s patron saint, who was actually born in Britain. At the age of 16, St. Patrick was kidnapped and sold as a slave in Ireland. After six years, he was able to escape and return home. He remained in Britain to study for 14 years, and then went back to Ireland to spread the Christian faith. It was this work that earned him the title as patron saint. You’ll have the luck of the Irish when you shop with SecurityCamExpert.com this St. Patrick’s Day. Purchase 3 of our SCE 1000TVL 720P IR Bullet Cameras and the 4th one is on us! Start building your own security camera system with this exceptional security camera. The SCE 1000TVL 720P IR bullet camera provides day and night vision with 1000TVL for quality surveillance around the clock. Its functional, intimidating, yet stealthy design make it an ideal security camera for various environments. Install these cameras in or around your home or property and rest easy knowing you can keep watch at any time. Our St. Patrick’s Day special is going on March 10-17, 2015. This special offer only applies to our SCE 30J100 100TVL 720P IR Bullet Camera with Varifocal Lens (Black) – limit 4 per order. This applies to both phone and Internet orders. Please mention the promotion when ordering to receive your fourth camera free (Internet customers, please use the Order Comments box to mention promotion). Based on website pricing and may not be combined with any other offers. Visit us online at www.SecurityCamExpert.com or call us at 1-888-203-6294. Shop now before your luck runs out! You can connect with us on our social networks, too – Facebook, Google+, Twitter, and Pinterest. Security Camera Systems On Sale! With the holidays around the corner, the prime time for thefts and burglaries is approaching. Now is a smart time to invest in your security and safety. You’re in luck – we’ve got a special new camera bundle for you this October. We’re offering our SCE 4 channel camera system bundle with 4 1000TVL IR/night vision for the low price of $519.99! This amazing bundle includes 4 IR security cameras, DVR with a 250GB hard drive, and proper power supply and cabling. All the essentials for a security camera system offered together for one great price! With this bundle, you get 4 of our 1000TVL 720P IR bullet cameras in black. These bullet security cameras pack a lot of great features into a sleek and petite design. With 1000TVL resolution, IR distance of up to 131ft, and a varifocal lens, these cameras will provide you with crisp footage day and night. Also included in our special bundle is our 4 channel HDMI DVR with a 250GB hard drive. These enable excellent recording and viewing of your surveillance footage. Our 4 channel DVR allows for different recording modes (Time Recording, Motion Alarm Recording, Manual Recording) and supports mobile viewing (Mobile Application Name: Streamview). With access to you security camera system from anywhere, you can rest at ease whenever you’re away. Four sets of 120ft premade Siamese cable and a 5AMP power supply with split allows your new security camera system to span a larger area for more comprehensive monitoring. Depending on scheduling and locations, we also offer installation services for our products. We happily provide you with everything you need to get your security camera system started. 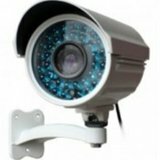 For great security cameras and more, let SecurityCamExpert.com help you find what you need. Visit us online or give us a call at 1-888-203-6294. You can also connect with us on Facebook, Google+, Pinterest and Twitter. Since bullet cameras are generally inexpensive in the realm of security cameras, they are commonly used in surveillance systems. Because of their more obvious nature, their presence alone can decrease any foul play. Bullet cameras can be useful in various environments, such as a restaurant setting. Whether it’s a small Mom-and-Pop, Hole-in-the-wall restaurant or a large, well known chain, these establishments will benefit from a security camera system. Installing a security camera system in your restaurant enables you to monitor your employee’s activity while you’re away. Detect any wasteful habits, horseplay, or theft. Placing a bullet cameras at different areas and angles aimed directly at the cash register should deter your employees from trying to pocket extra cash. Aside from keeping an eye on your employees, these security bullet cameras are there to protect your employees and customers from potential dangers. Workers are often at restaurants well after closing time to clean up and reconcile the register. Late nights are when criminals usually like to strike – limited lighting makes it harder to be identified. If there are bullet cameras installed around the perimeter of the building, criminals may be deterred. If they do act, you have video surveillance to help police identify and capture them. On the other hand, customers could be wary of businesses utilizing bullet cameras. People may interpret the presence of security cameras as the business being in a dangerous area. Some people just dislike the idea of being watched in general. The benefits of bullet cameras seem to outweigh these negative connotations. Your investment in security cameras help cut your losses due to thefts and robberies while keep patrons and workers safe. Feel free to shop our selection of security bullet cameras and more at SecurityCamExpert.com or call us toll-free at 888-203-6294. What Special Feature Makes Bullet Cameras So Convenient? Bullet cameras vary in size and shape, but overall are compact security cameras. They resemble a bullet shell casing, thus their namesake. Their size can range from an aluminum can to a tube of lipstick. The bullet camera is basically a petite version of a regular security camera. Bullet cameras have the same capabilities but delivered in a much smaller format. This, in turn, makes the bullet camera a much more convenient, cost-effective alternative for surveillance. Thanks to the bullet camera’s tiny shape, they are much easier to install. There is often no need for assembly after purchasing as they are usually already put together. Luckily, these cameras can be used indoors or outdoors. Despite the location of its use, the bullet security camera can utilize infrared sensors which allow for quality recordings in various light settings. Bullet cameras may also be available in black and white or color picture, as well as high resolution or HD. Because of its diminutive size, covert surveillance is easier. Bullet cameras are compact, discreet and cost-effective. Bullet cameras can be mounted indoors, hidden by a hanging plant or tucked discreetly in a corner. When mounting outdoors, bullet cameras often fit nicely on a wall, placed closely to the roof. Protective housing can be added to bullet cameras to maintain quality. Often compared to dome cameras because of their similarities in functions, bullet cameras hold the upper hand in long range monitoring. Bullet security cameras can have larger lens which increase range vision, whereas dome cameras are fairly limited by their shape. Also, since bullet cameras are slightly more obvious than dome cameras, their presence can discourage criminals from acting out. After mounting, repositioning and changing of angles is much easier for bullet cameras than dome cameras. When searching for a security camera, it is important to carefully study your needs, know your budget and weigh your options. Bullet cameras boast numerous features for a decent price, but they may not suit your needs. After evaluating your requirements, you may find that bullet cameras may or may not be a feasible choice for your system. Browse our bullet camera selection and more at SecurityCamExpert.com or give us a call at 1-888-203-6294 to have your questions answered by our accommodating staff.